Albuquerque, New Mexico – September 27, 2018: Optomec, a leading global supplier of production grade additive manufacturing (AM) systems for 3D Printed Metals and 3D Printed Electronics, today announced the opening of Optomec GmbH, its Europe, Middle East and Africa (EMEA) Operations Center in Dübendorf, Switzerland. Optomec GmbH will be located at Empa, the Swiss Federal Laboratories for Materials Science and Technology. As an institution of the ETH Domain, Empa is affiliated with the ETH Zürich (Swiss Federal Institute of Technology) a world-leading science, technology, engineering and mathematics university, which boasts Albert Einstein as its most famous alumni. Empa is a materials science and technology research institution, which belongs to the ETH domain. It specializes in application focused research and development and provides high-level services in the field of sustainable materials science and technology. Empa employs around 1,000 people in three places (Dübendorf, St. Gallen, and Thun). 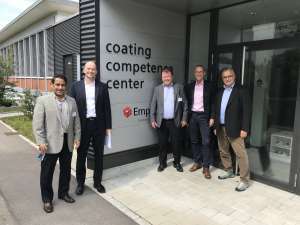 Dave Ramahi , Urs Berger- Optomec, Harald Moder- Merconics, Lars Sommerhäuser & Pierangelo Gröning, Empa in front of the Coating Competency Center at Empa in Switzerland.